The elements that create the perfect neighbourhood to call home can be elusive, but Byron is a place where they converge. You’ll find a matchless mix of close community, locally owned shops, great amenities and top schools in the most picturesque edge of the city. We’re privy to what coming back home to the idylls of Byron feels like; so rather than maximizing the number of units per foot, we’ve made the decision to build a small enclave of eleven iconic homes that will be a timeless and integral part of this neighbourhood’s fabric. Experience the luxury of settling back into your own rhythm, your community; your Alcove. The soul of a place is definitely its people—how they feel about this place, how they interact with it and with each other, that’s what The Alcove is known for. The leafiness and calm of Byron is unique within the city, as is the nature of its community. Experience the luxury of settling back into your own rhythm, your community; your Alcove. Built with quality and meticulous attention to detail fit for thoughtful, iconic design is what distinguishes Millstone Homes. The backdrop to life, a home should be the ultimate in bespoke lifestyle design. Every space, detail, every texture is designed as an experience—an experience with the serious purpose of making the residents of The Alcove a happy bunch, more productive, more engaged. Not only do we pride ourselves in our calibre of build quality, but also in the value we build—finding ways to achieve our homeowners’ desired outcomes within their budgets is our passion. We’ve demonstrated this with unmatched value all over our city and encourage you to compare the level of finishes, layouts and execution by seeing them firsthand. Not only are the surroundings beautiful, the amenities and conveniences happen to be the perfect mix of locally owned shops and conveniently placed services all near some of the city’s best schools. Our urban design and preservation efforts in building an interface whose enjoyment isn’t limited to only the occupants is testament to this. The architecture is informed and also benefits from Byron Baseline’s most unifying character: it’s beautiful mature trees that lend it an almost rural feel. Inspired by this natural setting, we believe that no design is more fitting than a more minimalistic style with mid-century cues and organic finishes of stone and wood. What are you waiting for? 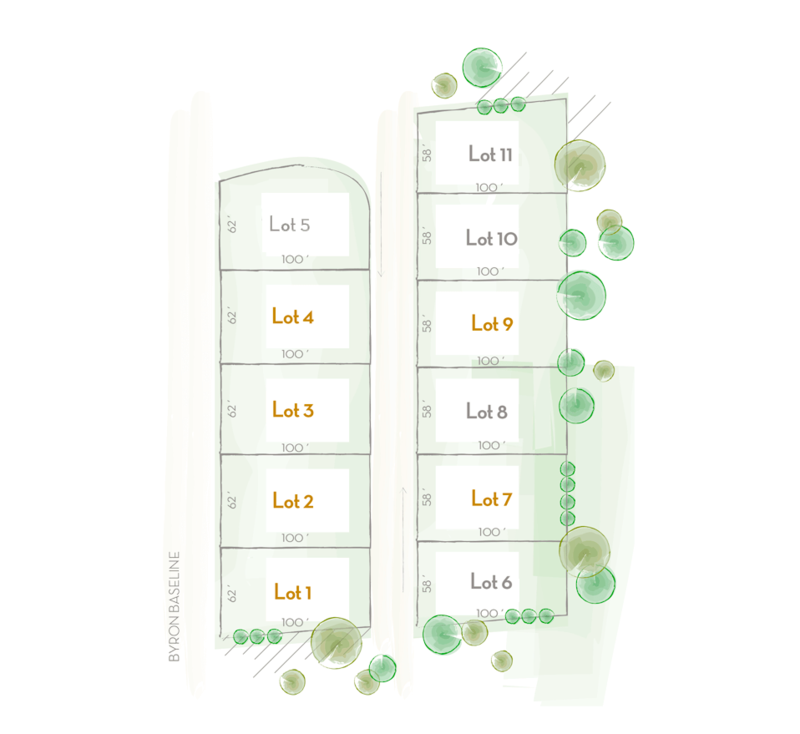 These lots will not last, contact us today!